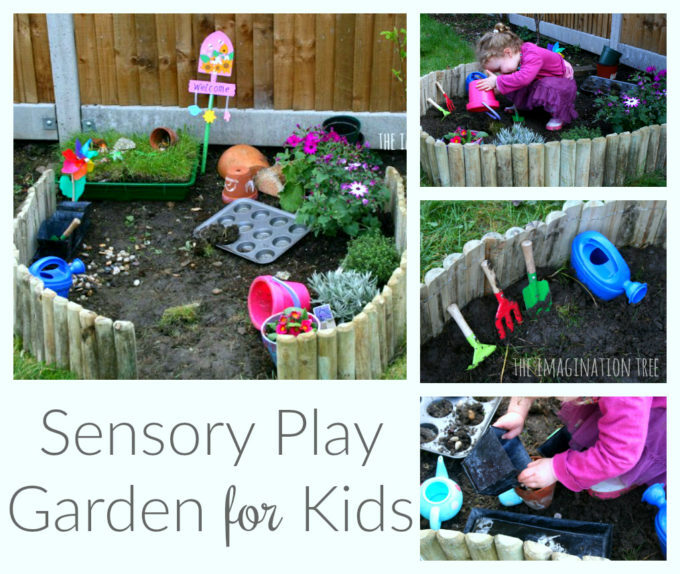 Make a dedicated play garden for kids to grow plants, enjoy sensory play and have a digging patch of their very own! 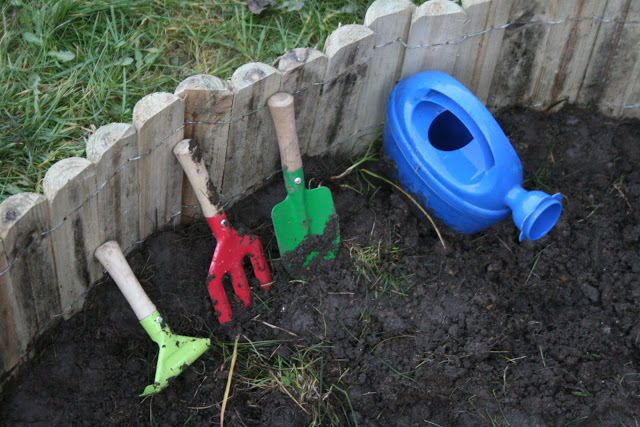 Perfect for toddlers and preschoolers to get stuck into gardening and enjoy outdoor play everyday. With Spring finally here, breathing a wonderfully sunny warmth and life into everything, we have been out in the park and the garden for longer each day. 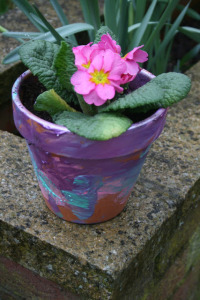 When we painted flowerpots and planted some primroses last month, I realised we were going to need a proper little patch of the garden for the girls to call their own where some playful and fun learning can take place. Our fabulous Pampa came over last week and helped to turn over a little semi-circlular patch of the lawn next to (a very empty!) flower bed. 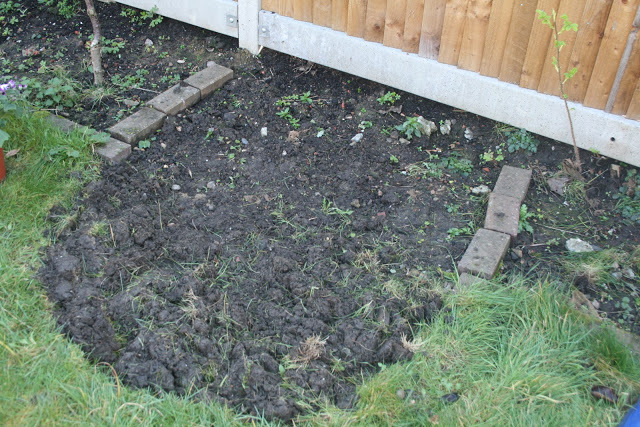 We moved the bricks that had been there and used them to mark out the edges of the garden area. Next, Cakie and I went on a big-girls-only expedition to the garden centre where we picked out some low fencing on a roll, a bag of compost, a few plants and some kiddie tools. We put the fencing around the semi-circle and left a little gap for getting in and out. 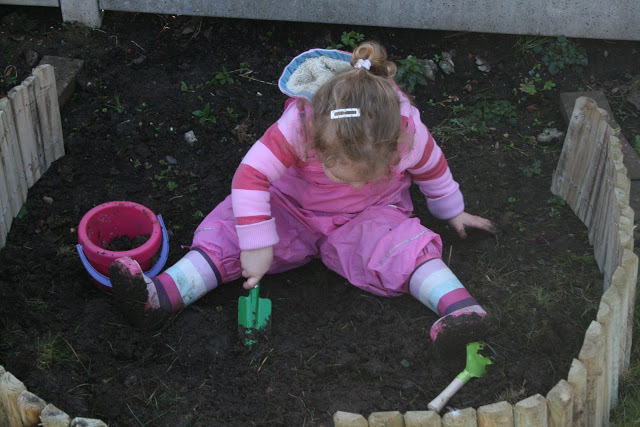 She told me “you forgot the gate Mummy.” Mud overalls on and straight into the patch to dig and make “mud castles” using the bucket and new trowel! 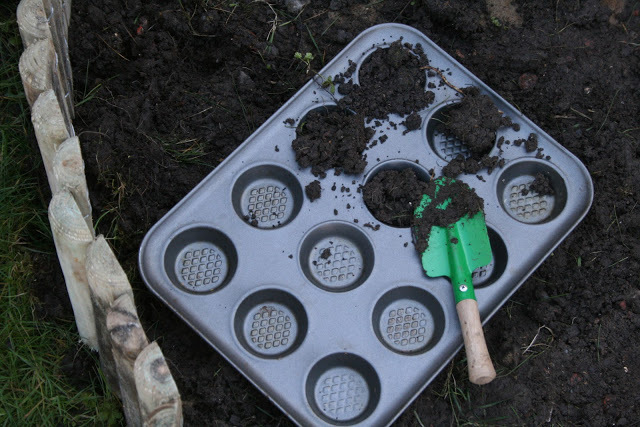 And some mud cup-cakes of course! 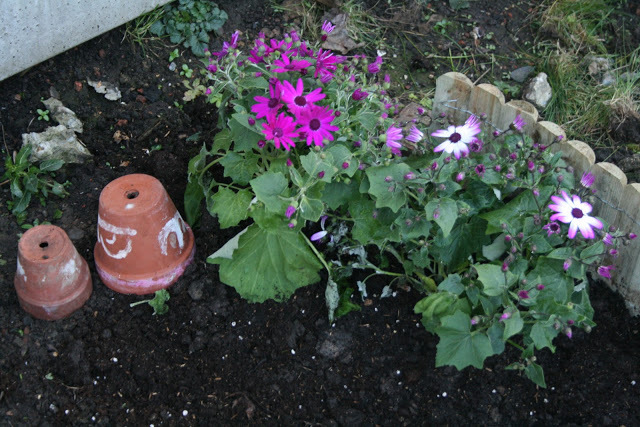 We planted her choice of pretty pink flowers and planted them in her newly painted pot. 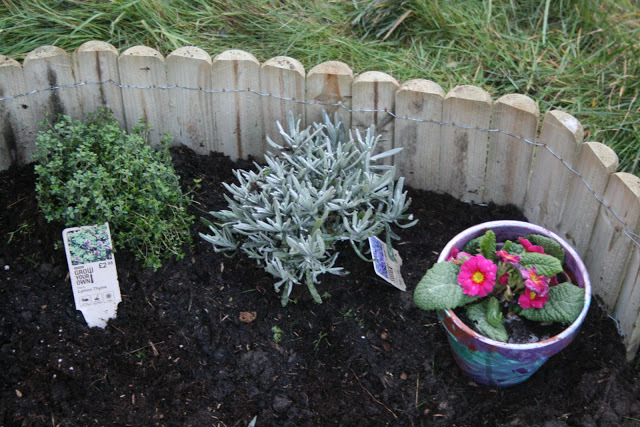 We also planted some lavender and lemon thyme to add a sensory section to the garden. Later we will move some mint over from the main garden too as well as a rosemary bush to fill the air with a lovely range of fragrances. We added some mini-tools for digging in the mud and her trusty watering can. We brought out a pile of the pebbles that she played with the other day and she used them to do tipping, arranging and collecting with. She used her plastic tea set to have a picnic. We added a little windmill for no other reason than it was pretty and she could watch it spin in the wind! 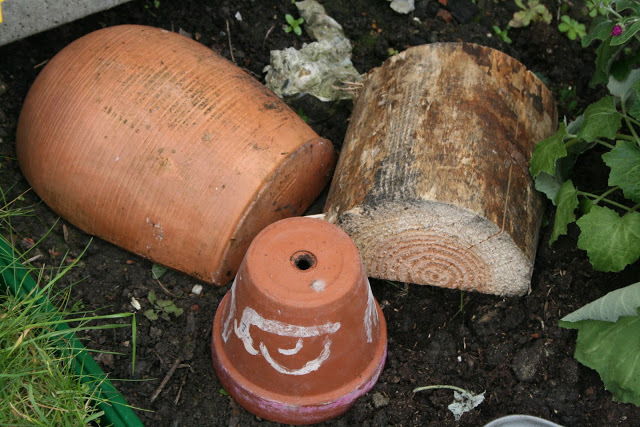 We used a turned up flower pot, half of a terracotta urn and a log to begin the makings of a mini-beast habitat. We will leave them undisturbed, face down in the soil for as long as possible to attract little creatures to come and live underneath and then we will take a look at what we can find with some magnifying glasses. 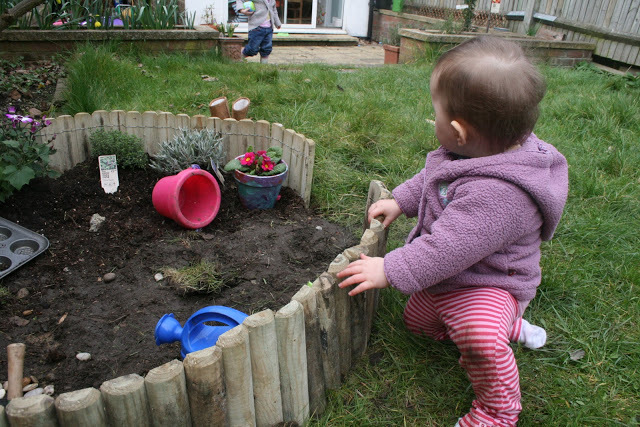 I placed some of the grass that we dug up from the lawn into one of our small world trays and put it at the back of the garden space for playing with. 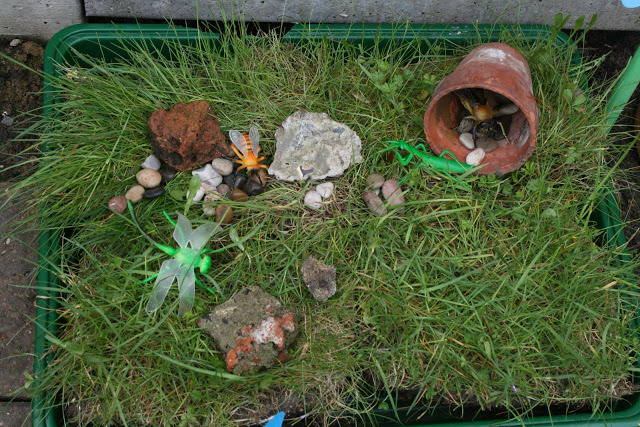 There are some plastic toy bugs, pebbles and a flower pot to form part of the mini-garden-within-a-garden small world scene! 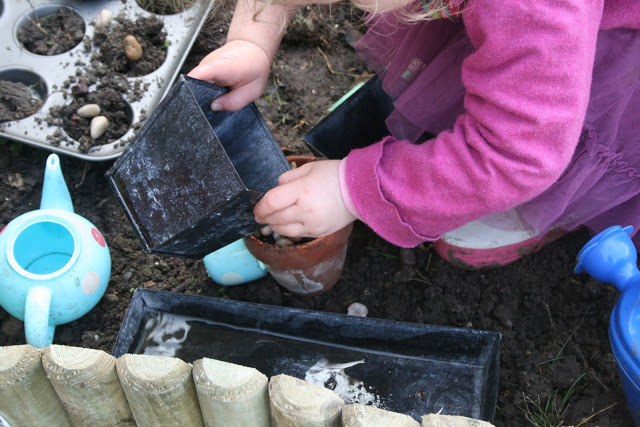 We shall we adding some instruments, opportunities for outdoor art, growing some vegetables and making a lovely, playful, imaginative mess together. This is already Cakie’s absolute favourite place to come and play and I can’t wait to see it develop into her very own, special space. One year later we planted this vegetable patch on the opposite side of the garden! 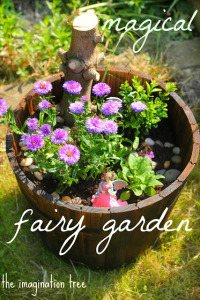 You may like to see our FAIRY GARDEN outdoor play area. 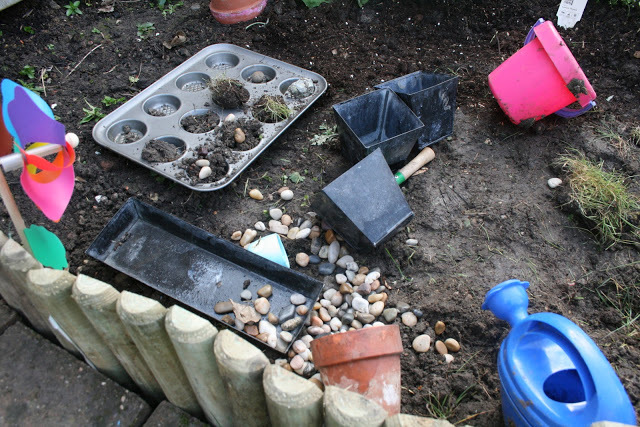 And here is an outdoor DINOSAUR GARDEN we made too! 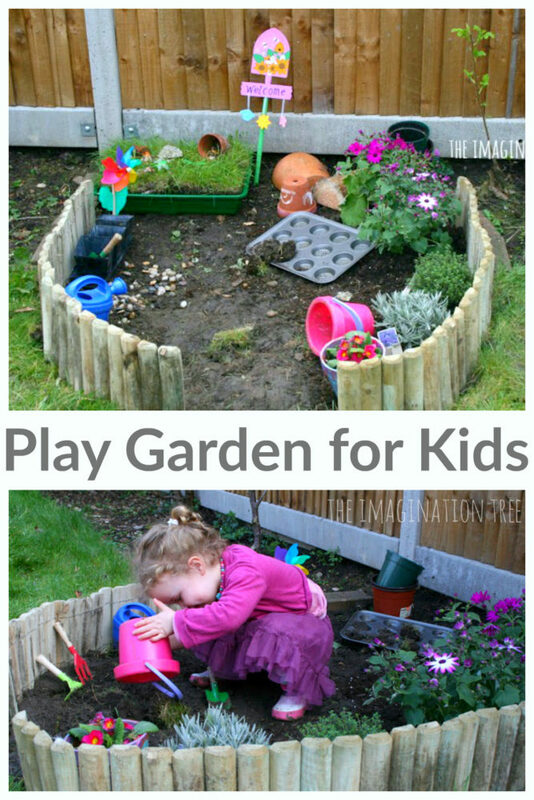 We’re planning a play garden at the moment so this post is well timed. I love the welcome sign and the small world you made. We bulit a wigwam from willow branches which will hopefully grow into a den. Fingers crossed! “Anonymous” that’s EXACTLY what I’ve just drawn a diagram of this weekend and was explaining how to make to my hubby! How did you find the planting? We had one in the playground at the school I taught at, and when the leaves grew it became such a magical little play house. I can’t wait to plant ours too. Any tips? Thanks! Wonderful! Love this! 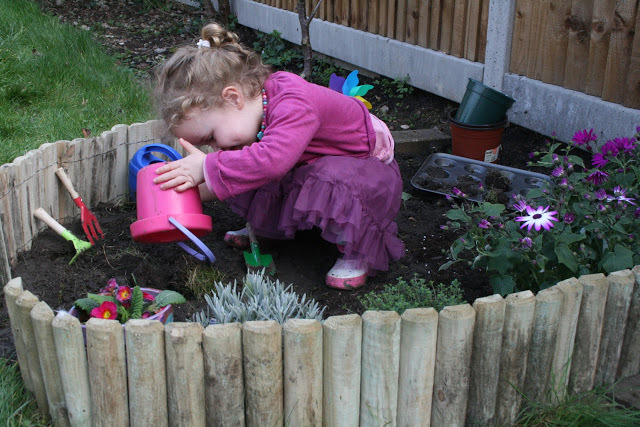 I always let my daughter play in our garden, but I Like the idea of having a separate garden for her! She would love it and be so proud of her garden! She looks forward to all the flowers coming up —she cannot wait for our bleeding hearts bush to come up in another month or two! My fav! Thanks for the inspiration! Loooove this! (Love everything you come up with, in fact!) My son would be in 7th heaven with his own garden and I can’t wait to plan it out! Thank you so much for sharing such a wonderful idea. I love the coziness of the garden, Anna! it’s getting warm here too, and I’ve been mulling over how we’ll transform our garden in the next few weeks. I’ve been thinking about the ENTIRE garden, but it’s nice to consider that I don’t have to start so big. Rachelle I totally agree about doing more of the garden too. I have some other plans for a willow shelter at some point this spring which I’m excited about! Although we do have an outdoor space which J loves, just wish it wasn’t concreted. Why don’t you plant a garden in a tote bin, then drag it outside when you are on the concrete block? Sometimes jt a small place to get started is a you need! We used the book ‘Living Willow Sculpture’ by Jon Warnes to help us make the wigwam. We’re lucky to have a Willow tree so we used the wood from that. The planting bit was fun and if this works out ok we may make a little tunnel as well. Can’t wait to see how yours turns out! I love this idea! There are so many life skills to be learned while playing here. That looks just lovely! Great idea. Oh, this garden looks so lovely. I love how it’s separated from the rest of the area to provide this feeling of belonging to a child. Oh how perfect!!!!! We need a BIGGER garden! This is brilliant. 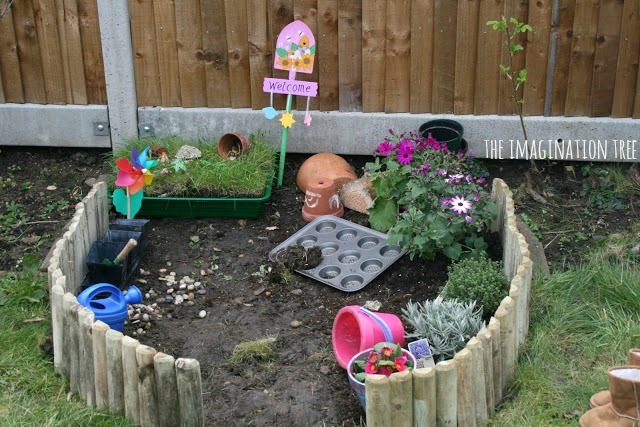 I remember wanting my own mini garden as a child…. perfect. Gianne that looks FAB!! We are planning a living willow structure, but I have to say, maybe we can sneak in a bamboo one too having seen yours! Love it. Thanks Ronnie. 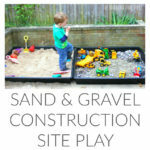 They have a play table that is filled with sand but we haven’t got a big pit yet. I would love to make one, although our garden is visited by foxes and cats and I need to figure out a seal tight method of covering it first! I absolutely think both things can co-exist as they serve completely different purposes in terms of play experiences. I’d love for you to link up some of your other great ideas to my Tot Tuesday linky party. Have a great day! Thanks for linking to this Annette! Thank you Jenn, I would love that. I will email you and also add some more links. I’m a bit behind on the link-ups at the moment! I LOVE this idea! A MUST for everyone! We are leaving on a 4 1/2 month trip but next spring or maybe even this fall…a fall garden, yes we could get it all prepared for next Spring…I so LOVE this idea!!!! What a fantastic, cute idea! What a fantastic idea. I love it! Thanks for a great post. 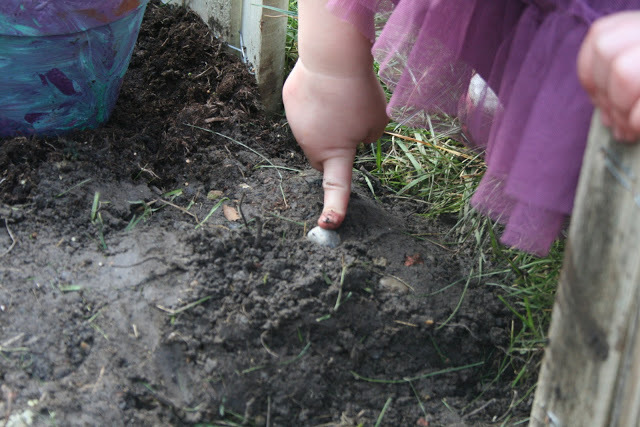 What a great way to develop the green thumb in our children. I hope to do the same with my boys this summer. Love! Thanks for this wonderful idea. We made a play garden for my oldest and she loves it. Thanks again. That is so wonderful! I would LOVE for you to come link this up in my new linky called Homescholing on the Cheap! It isn’t just for people who homeschool but for ideas such as this that is cheap for kids to do and something with which they can learn & grow. This is perfect for the linky. So cute. 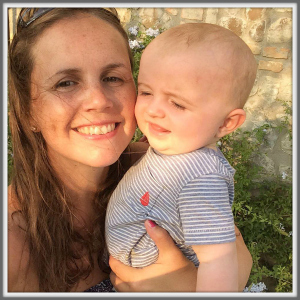 Can I link your blog to one of my blog posts? I really like this idea! Were we rent we have a shared garden so I put up a few bright signs (eg love, smile etc) for my son and a windmill but your idea is a few steps further and I really like it. I dont have a green thumb but for however long it last this is a cool idea. I’ll give it a go soon. I have been planning to do this exact thing for my little girl. So great to see a real version (not just in my head) and know it was a hit! What a sweet, little garden! Thanks for the inspiration. Lots of inspiration here, even on a cold, Christmas morning. Thanks for sharing. great idea.. I ‘d like to do a garden for my 2 year old baby too!! she loves to play outside. I’d love to see Part 2 or some followup pics from later in the summer. 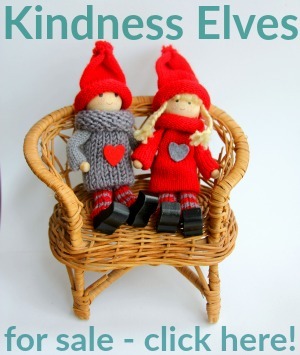 Fantastic activity – you are wonderfully creative! Anna, this is adorable! I am already thinking of where we could do this in our back yard. My twins will love this. So many great ideas in one post!